From artsy paintings to vintage clocks, find everything you need to pretty up your home in Motherland Crafts store. This store is not only an arts and craft store, it is a terracotta and handicraft boutique. Sounds fancy? Well, it looks that way too! Looking for some wind chimes for your living room, or some culturally rich idols for the showcase? This place has a bunch of options for you. 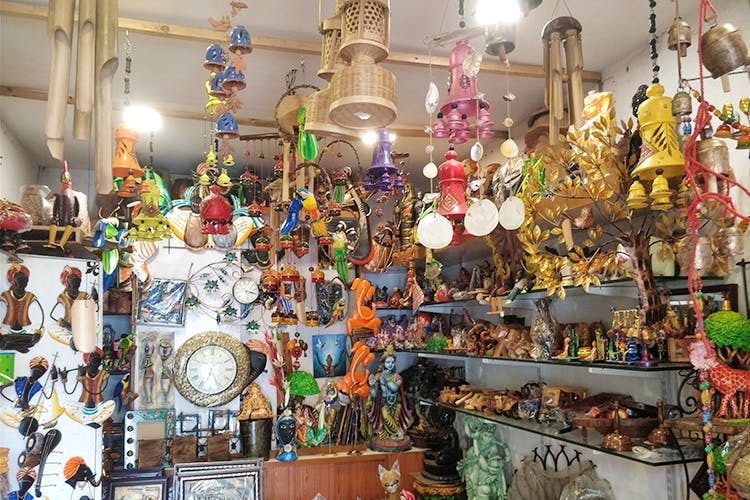 They have different types of ceramic hand-made hanging accessories starting INR 500 and have statues made from glass and wood starting INR 250. And the best part is they’re all from different themes. Music, performing arts, and nature are some of the themes around which the home decor products are designed. This store has got a very rich collection of little dolls for your Golu, including finished ensembles! So, stock up on the miniature wooden kitchen sets for Navarathri! Check out the simple but elegant wooden hanging lights and clocks starting INR 500. Whether you’re looking for some chic products or vintage home decor, this store has got you covered!